If you or someone you know has erratic emotions - excited and high one day and low and depressed the next; if someone you care about has recently been diagnosed with bipolar disorder; if a friend or relative seems to be somewhere in between these extrems, I can help you to begin living a better life - I suffered too. a Roller Coaster of Emotions? People are living their life in turmoil with bipolar disorder and they don't even know they have it. For those suffering with bipolar, that's just they way their life is - they grew into the disease and don't know there is another way to live. They're confused because they don't understand why people come and go in their life. Others stay, but it's a rocky relationship and they wonder why people don't understand them. Others don't know why friends and family are always telling them they're overreacting. Sometimes they're so depressed they just want to be left alone - why doesn't anyone understand it's too hard to get up and function on those days? There may be times when they wonder why everyone else seems to have their emotions under control, why can't they? There are many levels of bipolar disorder...not everyone is so manic they can't control themselves and others are just slightly depressed. But they just can't seem to regulate their moods. They can't even guarantee they will wake up in the same mood as when they went to bed! Maybe that's why they never want to make plans ahead of time - they never know what to expect until the day comes. Have you or someone you know been diagnosed with bipolar disorder? Do you want to know more about it? Then you've come to the right place. Bipolar disorder can go undiagnosed for years, and others are never diagnosed. You see, I don't know of anybody that goes to the doctor and says "I think I have bipolar disorder." Even if people understood what is really is, they wouldn't want to admit they have it. Bipolar disorder used to be called manic depression because of the two extremes of emotions experienced by the sufferer. At that time people were usually committed because of hallucinations, delusions and bizaare behavior. Only recently has it been realized that bipolar has many different forms. At first, the patient or family may only tell the doctor about panic attacks, OCD symptoms, organizational issues or depression. A person with bipolar can suffer a wide range of symptoms, but rarely do they go to the doctor complaining of being too happy - this is the manic side. You can read all the articles you can find on the Internet, but that would take a long time and what you really need is information on how to live with your loved one. If it's you that is suffering, don't you want to know how to live a normal life? All my life I wondered why my little brother would get mad and not be able to release the mood. Or he would get depressed for weeks and suddenly be "normal" again. He didn't know he was in a group of disorder sufferers because he saw our mother go through the same emotional changes since we were children. We just thought it was normal. Looking back, Carl went through friends faster than anyone I knew and he didn't understand why. All he knew was someone would pick a fight with him and never talk to him again. "What's that about" is what he always wondered and even when voiced to my mother, she couldn't tell him because she didn't know. My mother lived her adult life on Valium, but nobody diagnosed her with a disorder. How would she be able to help her son? She just thought he was difficult. Carl was not diagnosed with Hypomania until he was middle age. He suffered his whole life, going from one job to another. Although he was functioning, his quality of life was affected. After all, he didn't have hallucinations or delusions, just mood swings that kept him from wanting to socialize or even being able to socialize like "normal people." And that's why this eBook is so important. I reveal everything you need to know to live with bipolar disorder, why it's so difficult to diagnose and the signs to know when an episode is coming. Learning to live with the disorder and avoid "episodes"
When my brother finally got the help he needed, he was so relieved. He finally understood what his past was about and he was ready to talk with me about it. I was able to bring up memories from the past that he could now tell me the truth about what was going on in his head. This was a learning and healing experience for both of us. Now, I'm not going to tell you to buy this eBook and give it to someone you know who needs help. When you're living with bipolar, you think everyone else has a problem - not you. Nobody wants to be blamed for issues in the family or friendship. But if you or someone in your life is at a point where they know they need help, you can start a conversation with this inside knowledge. You may be responsible for your own healing or be the one person to love them enough to gently help. You don't have to drive to the store and you don't have to place an order and wait for it to arrive in the mail. 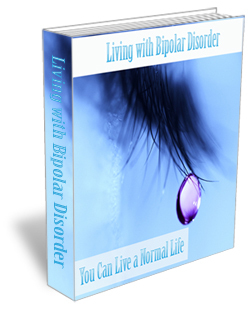 Order "Living with Bipolar Disorder" now and you'll be reading it within the next 2 minutes. This is a digital product that you can send to your printer and read it in your favorite chair or in your garden. It's beautifully formatted and includes photos. You won't be reading a bunch of technical terms that are meaningless. You can read all that on the Internet - read what you really want to know in my eBook written for you and friends and family of sufferers. ONLY $9.95 when you purchase today. This eBook is written from personal experience and with verified medical facts that I researched to "find out why." This is a Word document used to record your daily emotions and life patterns. By recording this information, you will begin to correlate moods to specific life events, allowing you to learn about your specific disorder and how to live with it. This Word document is a detailed chart of your emotions on a weekly basis. When completed, you can see at a glance how your moods change from mild to severe as you deal with daily events. Combined with the Mood Chart Diary, it enables you to provide detailed information to your doctor for proper diagnosis. In addition, it's a valuable tool to identify triggers leading to episodes. Unfortunately, most people put a special offer down and decide to think about it. You shouldn't need to think about it at this price and that's EXACTLY why I'm making this special offer. And unlike a book store, you don't have to make a special trip to buy this book or spend more money to get your refund! P.S. What if you decide to wait? Will you experience another "episode" - will this be the one that's life altering and the one you could have avoided? Get this information today and start living a normal life. Buy Now! P.P.S. Bipolar disorder can begin in childhood. It can begin between the ages of 22 - 55. It's not too late to get help. Purchase now with my special launch offer before the price increases.